Daily tooth brushing is one of the most important and effective preventive habits one can do to remove bacteria and plaque from your teeth and gums, and help prevent tooth decay and gum disease. So how does one use the toothbrush to brush their teeth? In essence a pea sized amount of fluoridated toothpaste is dispensed on your toothbrush, and you scrub your teeth in circular motions for 2 minutes. Spit out, rinse, and you are done. Continue reading below to get some tips and ideas to help improve your oral hygiene. One of the first things you can do is to select a proper toothbrush. There are toothbrushes in many different brands, colors, sizes, and shapes. In general any tooth brush with a soft head is preferred. 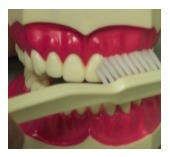 Hard and medium bristles can actually cause long term wear on your teeth and gums. Over time, dentists have found that a soft bristle is most gentle and likely best for most adults, children, and infants. The next step would be to choose a toothpaste. Most toothpastes available today are FDA and ADA approved, and make sure it contains fluoride. A good product I like is Colgate Total. Some kids and children may prefer a bubble gum flavored toothpaste. Just make sure your kids don’t swallow the toothpaste to avoid excessive fluoride toxicity. How does one exactly brush their teeth? There are many methods out there, but a popular one is to hold and angle your brush at 45 degrees, and point it toward your gum line and teeth, and brush in a circular motion. 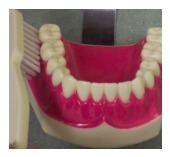 The motion and angle helps effectively remove plaque and bacteria on your teeth. Use this technique to brush the outer surfaces of the teeth against the cheek and on the inner surfaces of the teeth nearby your tongue and palate. To clean the chewing surfaces of your teeth, brush in a circular forward and backward motion, concentrating on the teeth’s little grooves and lines. I would try to allow at least a total of 2 minute each time you brush. If 2 minutes tooth brushing seem long, try brushing while watching the evening news or listening to the radio. Before you know it, you’re done! At first, the above tooth brushing technique may seem cumbersome, but it works well and once you develop a routine, it’s pretty easy! Electric toothbrushes have increased in popularity the past few years. They mimic the motion of the hand movement, and can stimulate each brush stroke very rapidly, more so than what we are capable of. Sonic Care/Philips, Oral-B, and Crest are a few companies that have developed their own versions of the electric toothbrush. In general, most work well; if using a electric toothbrush promotes brushing, it would be well worth it to use one. Check the companies recommendations and instructions on usage. Manual or electric toothbrushes, which is one better? Click here to find out more info. 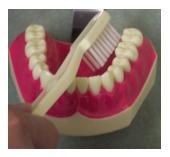 Brushing after each meal is ideal, but in general brushing once in the morning and before bedtime is sufficient. 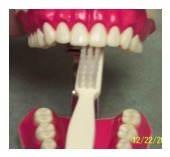 If you have any questions about brushing techniques, toothbrushes,, and toothpastes call us at (425) 614-1600.